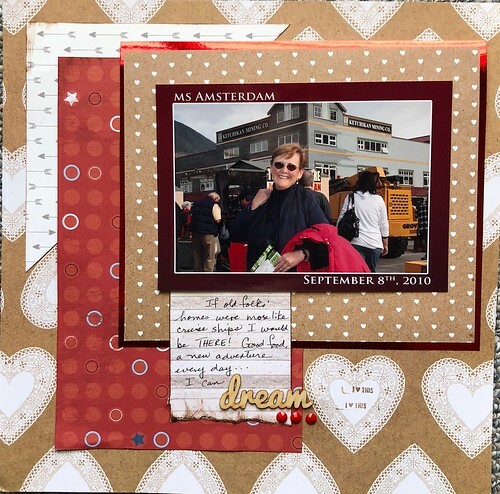 msliz - love the wood paper - it's just perfect for your photos! nylene - that card is awesome! grammadee - brrr! stay warm! love the papers you used for the banners/layering - perfect for pool pics! I can't believe I found time to scrap again today. Of course I won't tell you the things I left undone! For 28-4-28 Day 5 using Kraft, Yellow and Green. #45 Computer journaling, #47 Single photo, #48 Chipboard one page posted =25 points. Here's my first entry for the month, it's the layout I made for the 28-4-28 challenge I just posted. 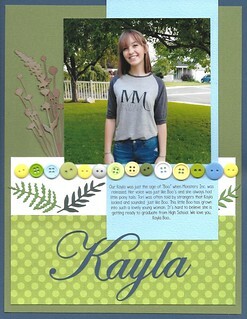 nylene - I love the grid look of Back to School and yellow/green are perfect with kraft! christinec68 - wow - that's a whole lot of buttons! I love it! Nylene you have some great clusters there and you made those colors work beautifully. Christine, love all your button layouts. I've got one ready to post and hope to do more. Thanks for the reminder to use them. I have a huge supply too, inherited from my mom who was a sewing supply collector. msliz, Down Tree: your paper choices are perfect here and such terrific layering too. nylene, such a cute popup card for dgs. He'll love it. Also, I'm glad I'm not the only one who thought dasmith2 looked like she was one of her kids. BackToSchool: I'm crushing on your bottom left cluster so hard. It's so perfect. And...Those undone things will always be there and you should rest your knees, so scrapbooking is obviously a good choice. grammadee, I think you had a successful birthday with Mermaids are Real. It's a gorgeous double page. Love the fish scale paper and pebble water drops. 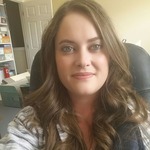 jeremysgirl - SO GLAD YOU HAVE JOINED US! I always enjoy you over on NSBR. I really like your use of "white spce" (even when it's "pink space") on your LO's. AussieMeg -Are you a digital scrapper? (I sometimes do also.) Love the font & the border. I am going to go hunt for that border now. @dasmith- Love the angle on your LO. What ink blob? You did well to cover it. I would never have known. On your 2nd LO is that mixed media? I really like it. KikiPea - May I scraplift? With 13 grands I do an awful lot of birthday LO's. I really like this one. msliz - what perfect pp! Here is my first submission of the month. For Christmas, my niece sent some beautiful pics of her family's fall photo shoot. I'll post points later.... Here are my point- I did Challenge #5 on 28-4-28,=1 point, created=2 points, posted=2 points, #10 flower=2, #23 opposites(blue/orange on the color wheel)=2, #28 page kit (Quick Quotes)=2, #40 arrow =2, #41- rectangles=1, #42-squares=2, #48-chipboard=2. Total=19 points. Thank you! You absolutely may. These are adorable. Love the fall colors and the kraft frames and flowers. You have a beautiful family. Awesome photos, patin. I wish we had had a photographer like that for our family photos! LOVE your pages! Will go into detail in the Gallery. kitbop - that is a gorgeous photo and the soft colours are perfect for it - what a fun title! 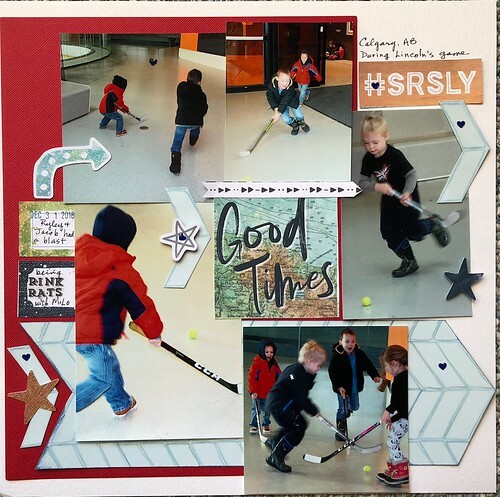 patin - wow- what great family pics! I love all the banners and the burlap and... lovely layout! nylene I left you love in the gallery! dasmith2 I love the bright pop of colors on the black background! And that cluster of hearts in the corner. grammadee there is love in the gallery for you too! I get so inspired seeing everyone's work! patin, that layout is lovely. I am loving the "wooden" elements, especially the frames around those pics. Which challenge is this layout for? Are you using Tapatalk app? That's what I use and it's so easy to add a pic. Right under where you type, there is a box to upload. You just tap it and it will allow you to select your photo. Then it will take a couple of seconds, the photo will upload and you push the send arrow on the whole post. Sorry I missed this. When you have a photo uploaded to Flickr, it’s easy to link it here. Click on the photo in Flickr. At the lower right, there will be a curved arrow. Click on the forwarding arrow. A dialog box should pop up. In the box box there will be an address. Above it are some choices. Be sure Bbcode is selected. Below the address there there is an opportunity to choose size. I chose Medium the first time, and it stays that size. Now copy the address that that appears in the window. Paste th address directly into your message. When you post, the photo will appear. Here are two pages. I had finished one for yesterday's 28-4-28 button challenge but just figured out this morning how to do the facing page. 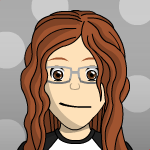 grammadee there isn't a curved arrow when I click on my pic! Under the photo is a star and a bubble indicating comments, and that's it. I'm sorry for causing so much trouble! Thanks for taking the time to help me. 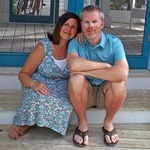 I am on my iPad, and when I click on your pic in Flickr the share arrow shows with the star and the download arrow. Not sure if you have to be logged in to Flickr to share? I tend to stay logged in with my iPad and computer, but not with my phone. patin, kitbop & grammadee, you have love left in the gallery. Those are really wonderful layouts, ladies! This is for 29-4-28 Day 6, Buttons. #2 5 comments, #3 28-4-28 day 6, #5 Love this girl, #7 Left side of sketch, #18 Hoarded buttons (it's great to use them) #22 Dies for leaves and tall grasses +2, #24 All Scraps except the blue background, #33 Newest dies, tall grasses, #41 Rectangle page, #42 Square photo, #45 Computer journaling, #47 Single photo, Pokey Peas Challenge, one page posted = 16 pts. grammadee I copied and pasted the url but the photo isn't showing up. Ugh. I'll try again tomorrow. Thanks! That's frustrating. I copied it here for you, but hopefully you will figure it out as well. PM me if you are still having trouble and I will try to walk you through it. grammadee thank you! I am not usually technically challenged so I don't know what is going on! 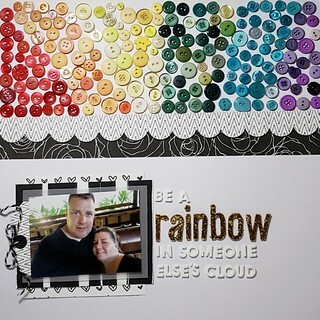 And sharing two more pages this evening, my sample for Friday's 28-4-28 challenge and it's facing page. 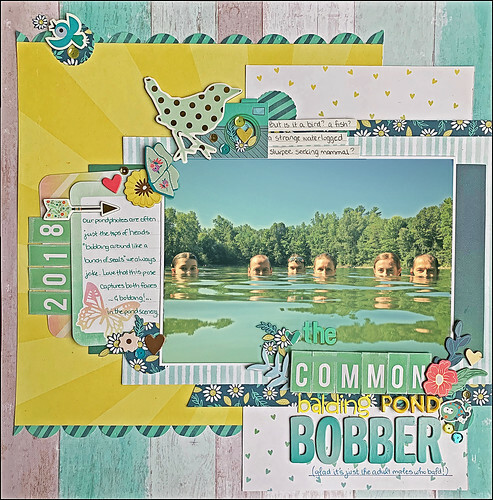 kitbop: The common balding pond bobber: Love the title & photo first! so funny! And as always, great layers, clusters and patterns! patin, Grateful: Love the frame work, the burlap, the flourished ribbon "buckle", the colors - it all works so well to make your photos of your niece & family the star. 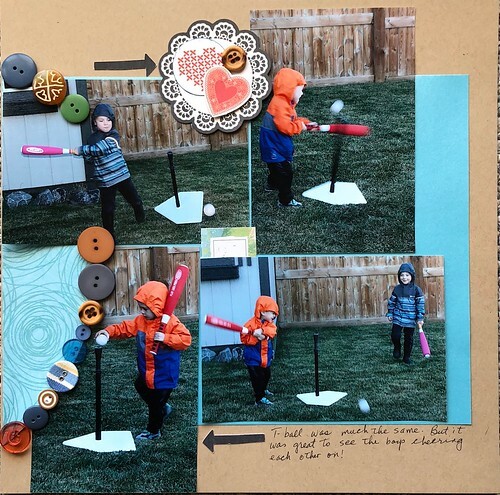 craftymom101, Storm Force Accelatron: Those photos are fantastic. I love the black and the key with wings, the wizards welcome muggles tolerated. 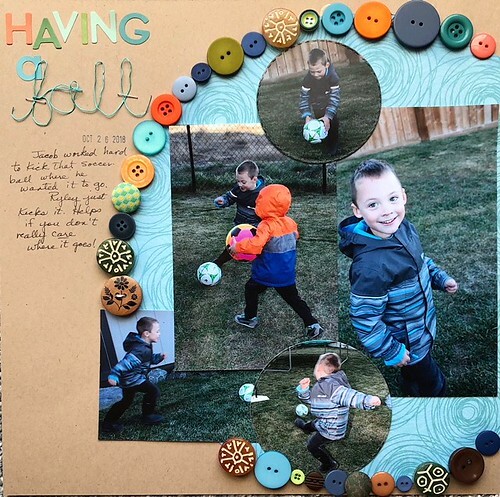 grammadee, Having a ball: love the title work with the various colors and the wire word, the circle element with buttons spanning the 2 pages. Great photos. 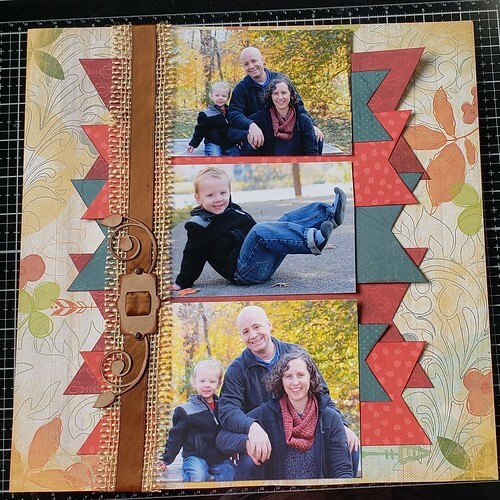 A Girl Can Dream: Fabulous page: I love the colors and patterns and that photo of beautiful you! Fun Cousin Time: Fab title work, great clusters, colors, and photos. I'm off to fave this one too. nylene, Kayla: love the blues and greens and button line. Off to fave this. 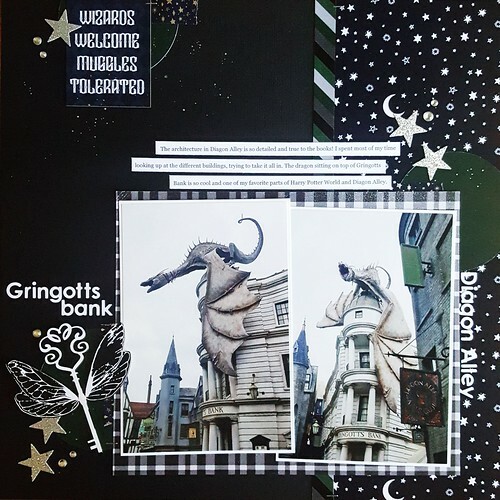 craftymom101, the silver work on black is an *amazing* look on Gringotts Bank, I love all your paper/embellie choices! 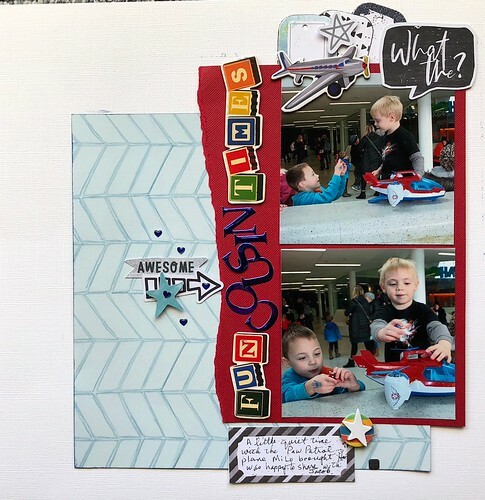 grammadee, I love your action double pagers, you capture the boys perfectly, love the way the light chevron paper breaks up the red! nylene - lovely as always, colours, placements, font, lovely. every wrong is redressed in silence and certainty. the fruit is in the seed. Dd loves those asian soaps on netflix and watches them while she knits. She is learning the languages and she will probably be able to read the characters that I goggled and put in the greeting. I also used some project life cards on the inside and back...trying to find ways to use them since I don't do PL. The front I stole from Hallmard digi cards. I never even thought about making her an asian card until it came up in my email. I hope to get a laugh and comment about how weird I am from them and if not, they'll be happy with the check! 22pts 6x6 pad challenge. That is really an ancient pad and it's really not 6x6 but some other strange size. I remember the day I bought it and I was in Michaels in Houston and I haven't been to Houston in 16 years. I'm using it again today...it also has some frames that I'm using. 15 points for Legoland. I can't remember which challenges inspired me for these pages. But I know it was 1 of them. I've been postponing adding up my points and writing down what challenges they are because it "doesn't spark joy", so, of course, I've forgotten what they were, but I am reading all the challenges and being inspired by them and I'm joyous about that. Since lisadv and gramadee promised me the challenge police would not be coming to my door, I think I will stop posting my points. But I am enjoying the challenges and trying to use as many as I can because I love the results. That’s how I do it to, it’s so much easier!